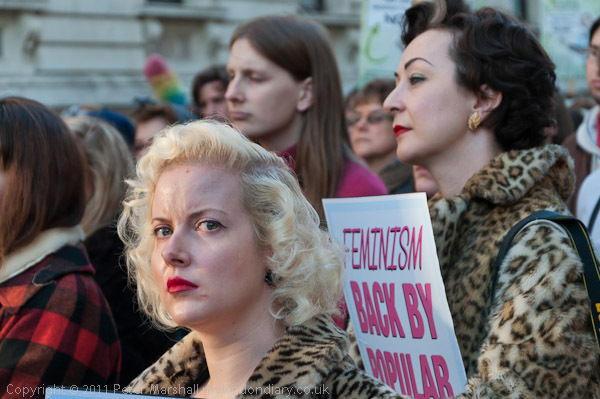 I don’t know what I had done to deserve that little glance, perhaps a hint of anger or at least annoyance, but together with the lighting that was just catching her face it lifted this image of a blonde from the others that I had taken of her and her fellow leopard skin fur wearer (I’m sure they were synthetic) holding their ‘Feminism Back By Popular Demand‘ posters. 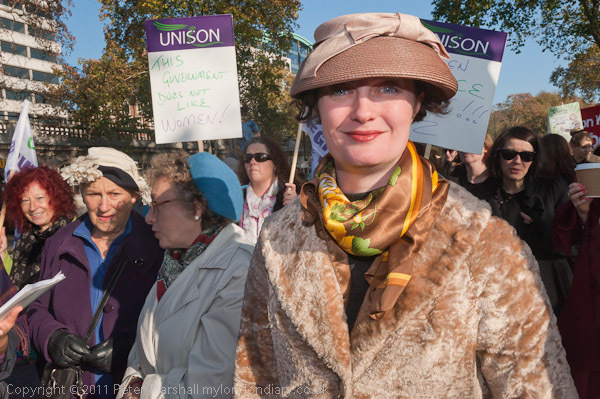 The Fawcett Society had decided to highlight their claims that government cuts were in danger of putting back the gains towards equality that women have made back to the 1950s by asking its members to attend the march in 1950s dress, and there were certainly some interesting examples of this, as well as those who came bearing kitchen implements, brooms and other symbols to represent their perception of the government’s “Kinder, Küche, Kirche” attitudestoward women. David Cameron certainly stirred up an enormous resentment with his patronising sexist House of Commons put-down of Labour MP Angela Eagle “Calm Down Dear!” and if he really intended it as humour it was abysmally judged and few took it as a joke. Of course I wasn’t there as a fashion photographer, but it was certainly hard to resist the opportunity. 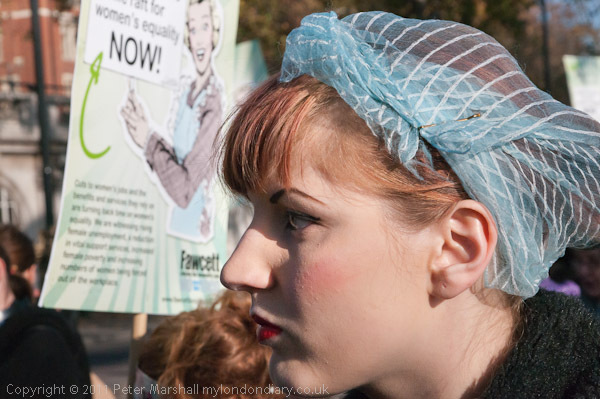 And so I didn’t, though I think almost all of the time I was trying hard to show these women in the context of the march, for example by very carefully positioning the background Fawcett Society placard in several images. 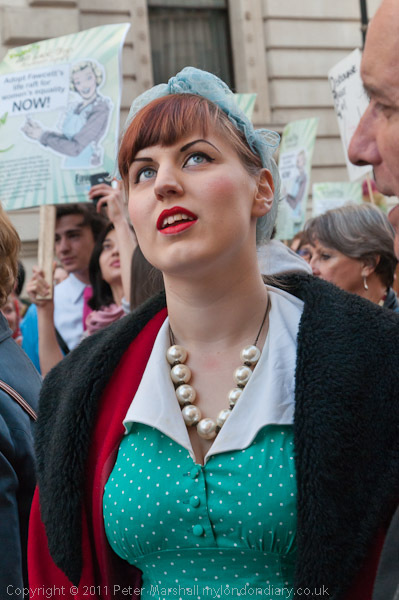 More pictures and more about the march in Don’t Turn The Clock Back on My London Diary. This entry was posted on Friday, December 23rd, 2011 at 05:48 pm and is filed under My Own Work, Political Issues. You can follow any responses to this entry through the RSS 2.0 feed. You can leave a response, or trackback from your own site.